Bandenawaz Badshah Nadaf paints by foot at HLF. 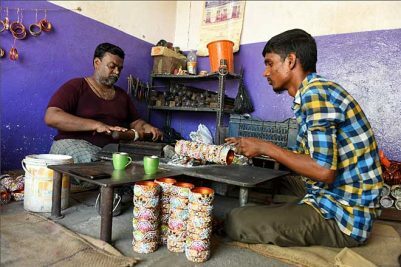 Hyderabad: He being differently-abled did not deter him from pursuing art. He lost both hands to an ailment as a child, but Bandenawaz Badshah Nadaf picked up the brush with his toes and started to fill the canvas with vibrant colours. At the Hyderabad Literary Festival, visitors stood around and watched in amazement as the 30-year-old Mumbai-based artist unveiled his creative talent. 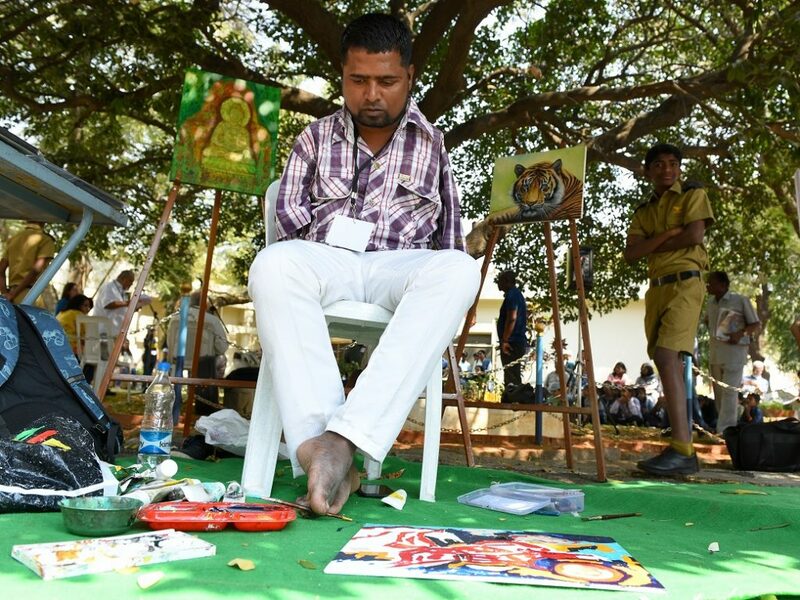 His works are displayed for sale and the proceeds from it would be shared with his group of 24 differently-abled artists. Apart from painting, Nadaf comes across a versatile personality with his expertise in cooking and playing tambourine. He also is a winner of two gold medals at the National Swimming Championship for the Disabled and in Karate, a yellow belt holder with prizes in mini-Olympics. Though a host of events were lined up for children at HLF, a beautifully told ‘Heidi’ attracted most. Heidi is one of the best-selling books authored by Johanna Spyri and is among the best-known works of Swiss literature. It is a novel about the events in the life of a young girl in her grandfather’s care in the Swiss Alps. Bringing this book close to the children, a team of story-tellers retold Heidi with short teasers of it translated into Hindi by Avanti Deosthale, a translator and story-teller. The short teaser reading in Hindi and German was followed by a reading in English by the Little Theatre. Apart from storytelling, music composed by George Hull and his team made the event lively for the children. “For the first time in the country, the story of Heidi was translated in Hindi. As most children love the young girl in this book, we decided to present main parts of the book through storytelling,” said George Hull. Dispelling notions that children and youngsters are moving away from reading habits and getting tuned more to technology and social media, the HLF saw them thronging in large numbers on the first day. While literature lovers showed their interest more towards workshops, stage talks and cultural events, enthusiastic children were seen staying glued to the book exhibition. The exhibition has more than 15,000 titles encompassing a wide range and including fiction and non-fiction. Varying genres such as political, science, travel, culture, biographies, romance, history and much more can be checked and picked up here. 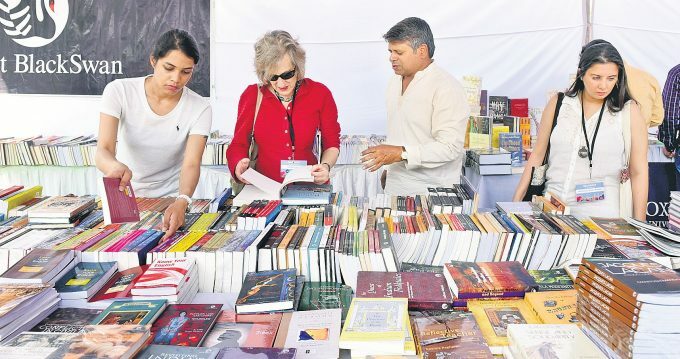 According to S Thomas, manager of The Book Point, book exhibition organisers, a discount of 10 per cent was on offer on all books. “Books penned by participating poets and authors in HLF are also available here,” he said. Hyderabad: To create awareness on the importance of rocks in the city and the need to conserve them, Society to Save Rocks showcased ‘Rockwalk’ documentary. The documentary highlighted the importance of rock formations of the Deccan which date back to 2,500 million years. Rocks needed to be saved from urbanisation and industrialisation, it pointed out. Secretary for Society to Save Rocks Frauke Quader said the rocks here were typical of the Deccan landscape. 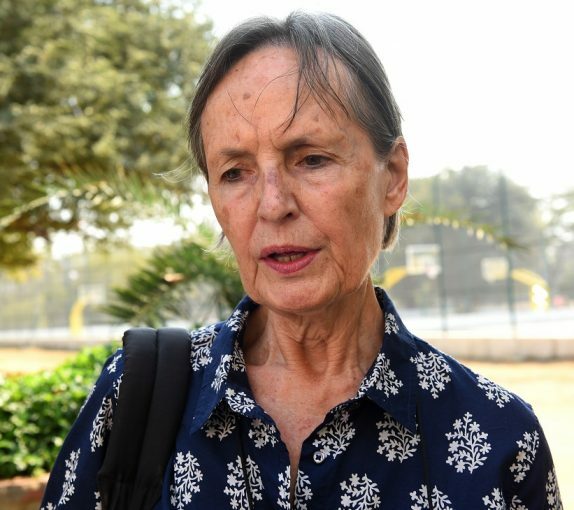 “Rocks sustain a very special ecosystem with unique flora and fauna, and once destroyed they can never grow back,” she said. Hyderabad is the only city in India where rocks are legally protected and the Society is working with the government to preserve them. 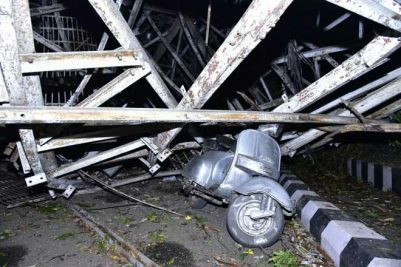 “Through cultural programmes, interactive lectures and rock walls, the society also shows people that modernization and progress need not involve the destruction of this natural heritage,” said Padmini B Patel, member of the organisation. 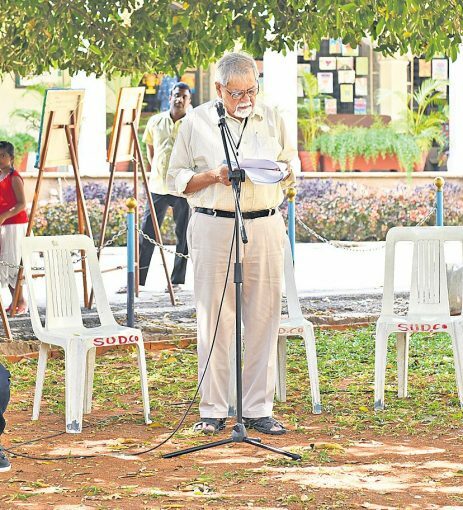 Hyderabad: A poetry reading of Prathibha Nandakumar (Kannada), Alejandro Palomas (Catalan), Harkaitz Cano (Basque) and Laltu (Hindi) was part of HLF. Poet Harkaitz Cano who hails from Northern Spain chose to read his first poem in the Basque language, shifting to English for his second poem, ‘People I call on the phone’. The poem touched upon the different types of people one encounters with the phone used as a metaphor. Alejandro Palomas, a recipient of Spain’s prestigious Nadal Prize for his novel One Love in 2018 read a poem on love. A tale of what makes one fall in love, its continuity and failure, emptiness, the absence of communication; the theme had many in the audience nodding in agreement. Highlighting effects of global warming and man’s apathy to environmental degradation were the themes poet Laltu talked about in his Hindi poem. 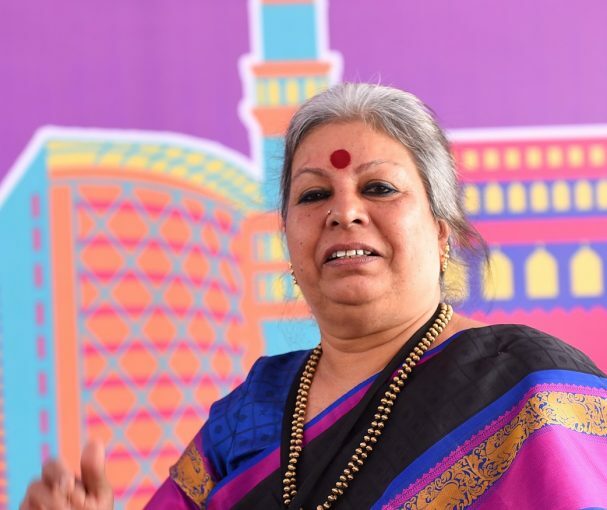 Upon the request of the audience to translate her first poem read in Kannada, well-known Kannada poet Pratibha Nandakumar declined saying it was culture specific and would take time, choosing instead to read a graphic poem on the misogyny of men and the double standard of society.